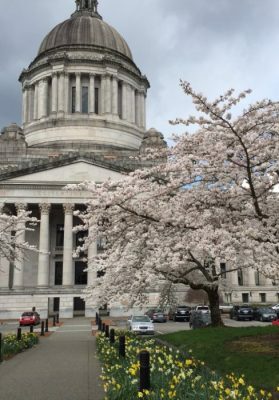 Washington Bikes is excited to be kicking off the 2019 legislative session in Olympia this week. This is the 105-day session or the “long session” which is the start of the biennium or two-year budget period. protected investments in the multimodal account which directly funds the Safe Routes to School and Bicycle and Pedestrian grant programs. We accomplished all of that in 60 days! This year Washington Bikes is looking forward to again, helping to create healthy, active and thriving communities. We are also looking forward to having a bit more time to achieve the following legislative and budget priorities that will make a difference for people who bike. 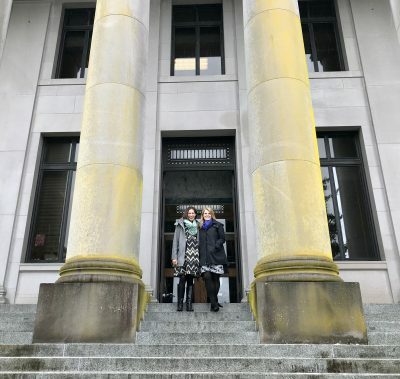 Washington Bikes is working with Representative Kilduff (28thLD, University Place) on legislation to update Washington’s vulnerable roadway user (VRU) law. The VRU law update will provide clarity regarding when the VRU is applicable, strengthen the penalties, direct funds from VRU penalties toward education of the public, law enforcement and courts regarding the VRU law, and lastly, define a safe passing distance from people who are biking and walking. The multimodal transportation account dedicates funds for transportation for rail, ferries, transit, biking and walking, which are multimodal in nature. These investments include: the bicycle and pedestrian grant program, regional mobility grants and Safe Routes to School programs and projects. To ensure all Washingtonians – even those that cannot drive a car – can get around, Washington Bikes supports opportunities to grow the multimodal account and bike/pedestrian grant programs. Additionally, the limited multimodal dollars must remain dedicated to the purpose of providing transportation choices and solutions. Trails form a backbone of many of the biking and walking networks statewide. Key project priorities include the development of the cross-state Palouse to Cascades Trail. The Cooper Jones Bicyclist Safety Advisory Committee and the Pedestrian Safety Advisory Committee will merge to form the Active Transportation Safety Advisory Committee (ATSAC). The ATSAC will be convened by Washington Traffic Safety Commission and comprised of stakeholders who have an expertise in bicycle and pedestrian street safety. The Council would analyze data related to bicycle and pedestrian fatalities and serious injuries and then identify vulnerabilities in the system and recommend improvements. This is agency request legislation. Washington Bikes will be working hard over the next 103 days to help create safer streets, increase protections for people who bike, and connect and grow bicycle and trail networks throughout Washington. Stay in touch by signing up for Washington Bikes’ alerts! Gabe Meyer is the new Policy Director for Cascade Bicycle Club and Washington Bikes. Gabe oversees all political advocacy efforts to shape public policy to make bicycling safer and more accessible for all. Based in Seattle, his team works on issues at the neighborhood, city, county, regional, and state levels in Washington State. Before joining Washington Bikes, Gabe held numerous positions with non-profits and political campaigns, most recently as Finance Director for De-Escalate Washington’s Initiative 940 and as Campaign Manager for WAmend’s Initiative 735, before that. He has experience at the city, county, state, federal, and international levels of policy-making through positions at Not This Time, McGinn for Mayor, the King County Municipal League, Mike Honda for Congress, Seattle’s World Affairs Council, and the World Economic Forum in Switzerland, among others. Gabe’s love for biking spans the areas of travel, recreation, and commuting. He once rode on his own from Phoenix to Tucson and looks forward to this year’s STP. Gabe often mountain bikes off I-90. And from first to third grade, Gabe biked to and from school every day. Gabe was born in Seattle, raised in Southwest Washington, and graduated with a degree in Political Science and Communications at Seattle Pacific University. He earned his Master’s Degree from Seton Hall University’s School of Diplomacy and International affairs, focusing on negotiations and economic development. In his 20s, Gabe lived in Chicago, Los Angeles, San Jose, Geneva, Paris, and New York before returning to settle down in Seattle. He now lives in Capitol Hill with his wife Angela and their dog Poptart. 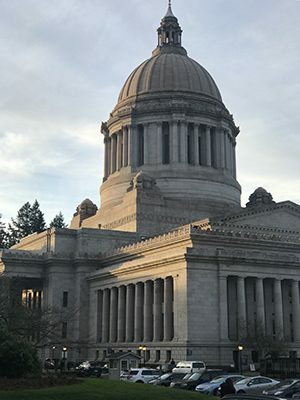 Don’t miss this opportunity to connect with bicycling advocates, planning professionals, and legislators during the 2019 legislative session in Olympia, WA. The Washington Bike Summit, including all panel sessions, breakfast, and lunch, will be held at Hotel RL in Olympia (2300 Evergreen Park Dr SW). You can now check out all of our guest speakers. For all details related to the Washington Bike Summit, go to cascade.org/summit. Rooms are going fast for the legislative session. Book your hotel now! To get specials rates at Hotel RL for attending the Washington Bike Summit, call calling Donielle Vanderlip at 360.252.0984. Early bird registration is now open! Registration cannot be purchased on-site, so now is the best time to book! As a non-profit organization, we work to broaden the inclusion of voices and perspectives at the conference for the benefit of all participants. If you need help to defer the costs of registration, then consider applying for a scholarship! You must have a cascade.org account to register or apply for a scholarship (it’s easy and it’s free!). This year Washington Bikes endorsed legislators who led or partnered on efforts to create safer streets, increase accessibility to trails, improve healthy communities and health outcomes, and contribute to the economic vitality of Washington’s communities. Additionally, Washington Bikes has endorsed first time candidates who share our vision for lowering the barriers to bicycling for all ages and abilities. Why do we make endorsements? Washington Bikes works to secure funding for bicycle infrastructure and policies that increase access and safety. To make that happen, it matters who Washington’s elected leaders are. We’d like to thank all of the candidates, endorsed or otherwise, for taking the time to participate in Washington Bikes’ endorsement process. 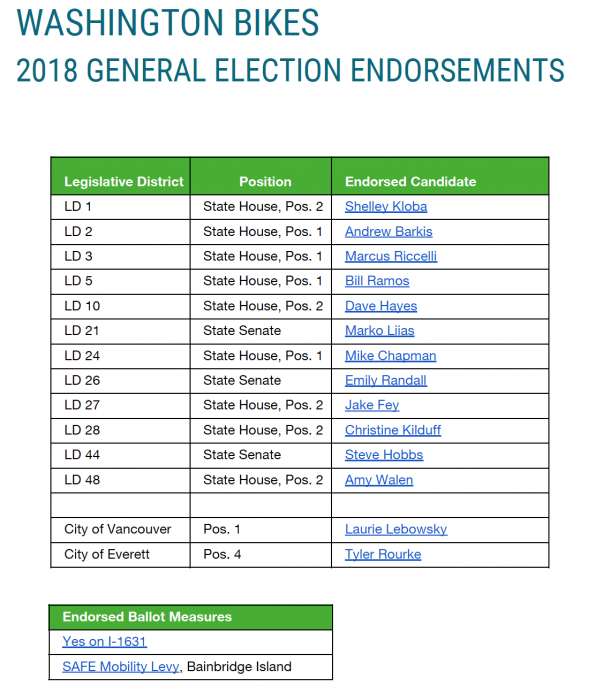 Washington Bikes is pleased to announce endorsements for two ballot measures that will appear on November ballots: the SAFE Mobility Levy and I-1631. The SAFE Mobility Levy on Bainbridge Island is a property tax levy that will raise city revenues for active transportation and recreation projects by about $2.2 million a year for seven years. If passed, the measure will yield investments in infrastructure improvements for people who bike and walk, including shoulder widening, bike lanes and trail projects with an emphasis on safe routes to school. I-1631, the statewide clean air initiative will impose a $15 fee on each metric ton of carbon dioxide beginning in 2020 and increase $2 annually until the state achieves its emissions goals. The funds raised will invest in programs, activities and projects aimed at improving clean air, clean energy, healthy forests and healthy communities. 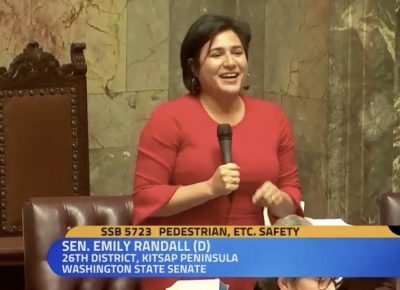 If passed, I-1631 will invest in reducing vehicle miles traveled and increasing public transportation, non-motorized transportation and affordable transit-oriented housing. These efforts align with Washington Bikes’ goals around healthy communities, mode shift and thriving local economies. The Washington Bikes endorsement speaks to thousands of engaged Washingtonians statewide who care about a range of issues. From wanting more connected trails, to safer neighborhood streets, to more opportunities for physical activity, Washingtonians are looking for leaders and policies that will advance these priorities. *Download a PDF version of the endorsements list. With less than six weeks until Election Day, we are in the final stretch! Are you ready to vote? Make sure you are registered to vote through the Washington Secretary of State’s office. If not, you still have a couple of days to register. Monday, October 8th is the deadline to register to vote in the November election. Curious what will appear on your November ballot? Check out your sample ballot at Ballotpedia. Lastly, Washington is a vote-by-mail state, so expect your ballot in the mail in roughly two weeks. New E-bike law in Washington state takes effect on June 7, 2018. In early 2018 the Washington State Legislature passed SB 6434, establishing a legal framework consistent with national standards and giving the electric bike (e­-bike) industry greater certainty in the Washington market. The new law also more clearly defines where e-bikes can and cannot be used on bikeways, trails and streets, as well as ensuring that jurisdictions and agencies have the tools for enforcement and management of e-­bikes on our streets and trails. What does the e-bike bill do? It depends on where you’re riding. If your city doesn’t have specific laws on the books, the default is that Class 1 and 2 e-bikes can go everywhere traditional bikes can. Class 3 e-bikes are restricted from shared-use pathways, as well as sidewalks. There is an allowance for Class 3 bikes on sidewalks in cases where there is no other safe alternative. Class 3 e-bikes are allowed on infrastructure that is within or adjacent to a highway (street). E-bikes cannot be ridden on a trail that is designated as non-motorized and that has a natural surface made by clearing and grading the native soil with no added surfacing materials. This provision in the legislation was amended to help improve interactions with other types of users on soft-surface single track trails. Exceptions may be made by a local authority or agency of this state that has jurisdiction over a particular trail. Are e-bikes allowed on sidewalks? Class 1 and 2 e-bikes are treated as traditional bikes, which means they are allowed on sidewalks, subject to local laws that restrict bicycle riding on sidewalks. Class 3 e-bikes are prohibited on sidewalks except when there is no other safe option for the bikes to travel (for example on a bridge without a trail or other safe place to bike). How fast do e-bikes travel compared to traditional bikes? The top assisted speeds of 20 mph and 28 mph can be deceiving. E-bikes typically resemble traditional bikes in function and average speed. Studies suggest a difference of 0-5 mph between a traditional bike and e-bike. It’s important to note that like motor vehicles, most people biking are not typically traveling at top speed at all times. This is the same for e-bikes. Why restrict an e-bike’s power output to 750 watts? What do e-bike manufacturers and retailers have to do because of this new law? The law will be enacted June 7, 2018, with the requirement to label new e-bikes on July 1, 2018. I owned an e-bike prior to the 2018 legislation becoming a law; what happens to my e-bike? E-bikes purchased prior to the bill becoming law are not subject to the new requirements in the e-bike law update. Last summer, Washington Bikes began working with stakeholders and partners to begin crafting legislation to update Washington’s e-bike laws to national standards, and in a manner that worked for Washington communities. 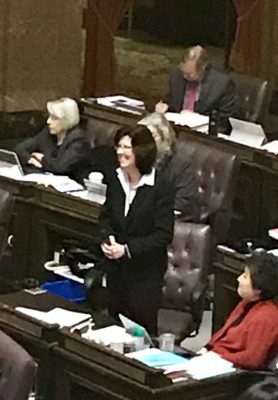 SB 6434 (Sen. Rolfes) and HB 2782 (Rep. Kilduff) introduced at the start of the 2018 legislative session were the outcome of that work. 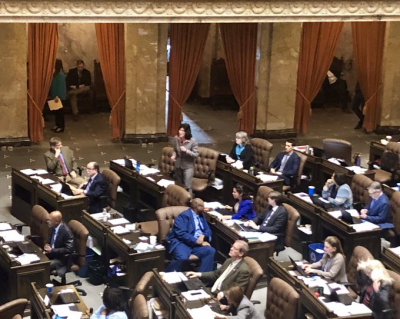 Tuesday night, the Washington State Legislature passed SB 6434, sending the e-bike bill to the Governor’s desk for signature. 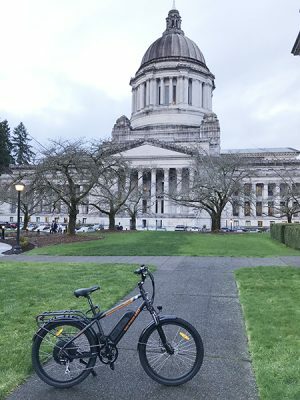 While innovation and demand in the e-bike industry are the reasons a statute update was necessary, interest was also strong among Washington state legislators. While developing and discussing the bill, we discovered four state lawmaker e-bike owners and we had the opportunity to introduce the innovative technology to many more legislators who are now interested in e-bike ridership and ownership. Now the bill is headed to the Governor Inslee for signature, likely in the coming month. It’s been a great ride. Our sincere thanks to primary bill sponsors, Senator Rolfes and Representative Kilduff for their leadership throughout the 60-day session. Also, thanks to Senators Curtis King (14th LD, Yakima), Rebecca Saldaña (37th LD, Seattle) and Representative Mike Chapman (24th LD, Port Angeles) for their work on crafting improvements to the legislation. Ultimately, this legislation is about giving more people more options and the freedom to get out on a bike. As the legislators above noted, e-bikes open up a world of possibilities, particularly to the 60% who would like to bike but feels limited in some way. Washington Bikes works to make bicycling better in Washington state. It doesn’t happen without you. Make a donation today to support the legislative work that made this bill possible! working to improve safety on Washington’s streets for vulnerable roadway users. Read on for an update on our progress with nine days to go! Measuring the economic impact & health cost savings of biking and hiking in Washington. Washington Bikes and Washington Trails Association working with legislative champions, Senator Van De Wege (Sequim) and Representatives Barkis (Olympia) and Chapman (Port Angeles) advocated for $125,000 to conduct the study of the economic and health benefits of hiking and biking for Washington state (Operating budget). Both the Senate and House versions of the Operating budgets include the $125,000 funding for the Recreation and Conservation Office to carry out the study. Legislation to update Washington’s e-bike laws to national standards. SB 6434 (Sen. Rolfes) concerning electric-assist bicycles had a successful hearing in House Transportation committee (opposite chamber of where the bill originated). The bill was then voted out of committee, sent to House Rules committee, and last night the bill was pulled from House Rules to the House floor calendar. The legislation has until Friday, March 2 to be voted on by the full House. Legislation to strengthen Washington’s vulnerable user laws. HB 2900 (Rep. Kilduff) concerning violations of traffic laws that place vulnerable roadway users at increased risk of injury and death. Unfortunately, HB 2900 died in House Rules with the House of Origin cutoff deadline. This bill was introduced late in session and came through House Transportation committee with direction to continue working on the policy. The need for more effective vulnerable user laws is significant because the education and awareness about the existing law is lacking. Luckily the bill sponsor and stakeholders will continue to work on refining this legislation with hopes of strengthening the vulnerable user laws in a future legislative session. The legislature is currently in the process of passing the 2018 supplemental Operating, Capital and Transportation budgets. Afterwards, focus will turn to floor activity and passing the remaining legislation for the 2018 legislative session.